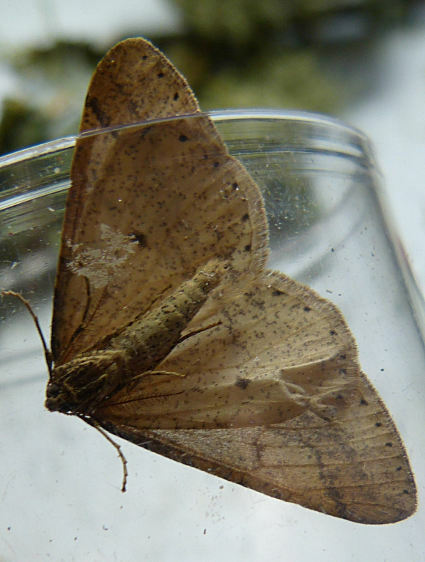 The Dotted Border is a cold-tolerant moth that regularly visits lit windows in late winter and early spring, most often in February and March. The patten is rather variable but basically consists of three lines going across the wings. The upper line, near the head, is rather jagged. The middle line is almost straight, and the lower line is straight in the inner half but has a step going down at 45 degrees to its outer part. 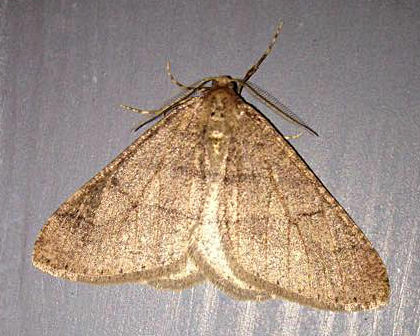 Often the area below the lower line is darker than the rest of the moth, as in the example above. In this example the background colour of the wing is uniform; it is not darker below the lower line. 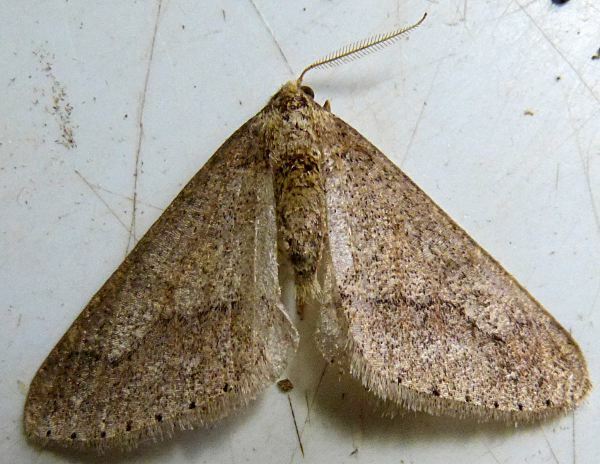 This one was caught by Noelle Odling in a moth trap on Lismore at the very early date of 15 December. All our other Dotted Border records are ones that came to house lights in February or March. 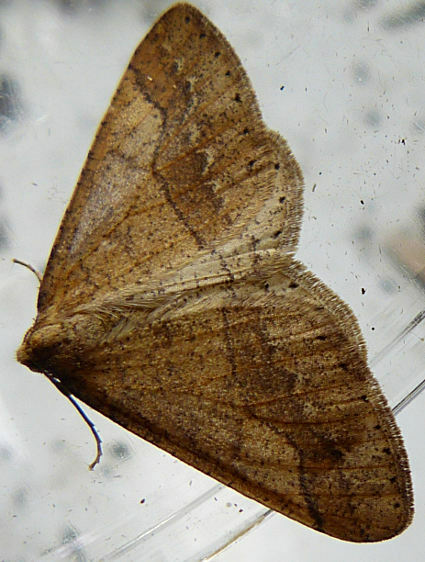 The main confusion species are its close relatives Mottled Umber, Scarce Umber and Spring Usher, all of which occur in our area in winter, though the first two are unlikely as late as February. The Dotted Border can be told from all these by the middle line across the wings which is more or less midway between the upper line and the lower line. The Scarce Umber has the middle line much nearer the upper line, and the other two don’t have anything like a straight middle line going right across. Also the Dotted Border has a line of dark dots along the bottom of the wings. The other species lack this, but beware of Mottled Umber which has chequered fringes, i.e. alternating dark and light along the fringe of hairs at the end of the wing. 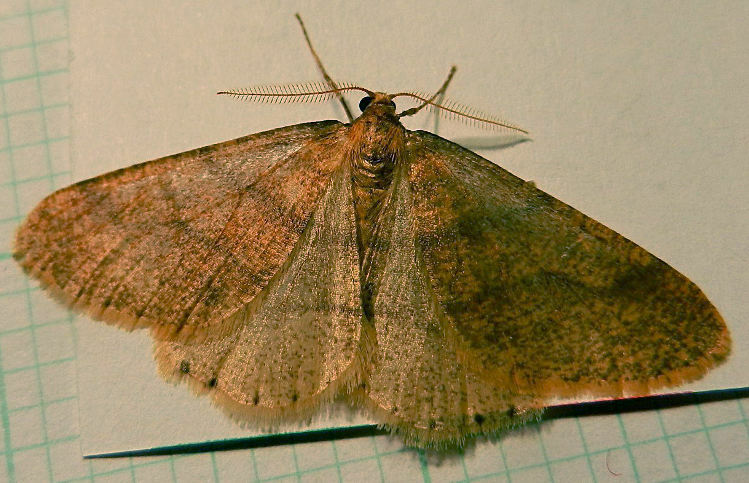 The Dotted Border’s dots are on the wing membrane, not on the hairs fringing the wing. Front and rear view of a specimen from Taynuilt. On this one the middle line is unclear, and the dark area below the lower line does not go all the way to the end of the wing. But the black dots along the wing margin leave no doubt that this is Dotted Border. On this one the upper and middle lines are missing, probably due to wear, but the lower line with its angled step, and the black dots along the wing ends are clear enough. This worn specimen also has one of its antennae missing, but the remaining one is well feathered, showing it to be a male. Indeed, all Dotted Borders that fly to windows are males, since the females are flightless, in common with many other winter moths. Please send in your Dotted Border sightings using the form below, or email sightings@lnhg.org.uk with the details if you prefer. If you are not sure of the identity of your moth, please send a photo to sightings@lnhg.org.uk, or put one on the LNHG Facebook page.